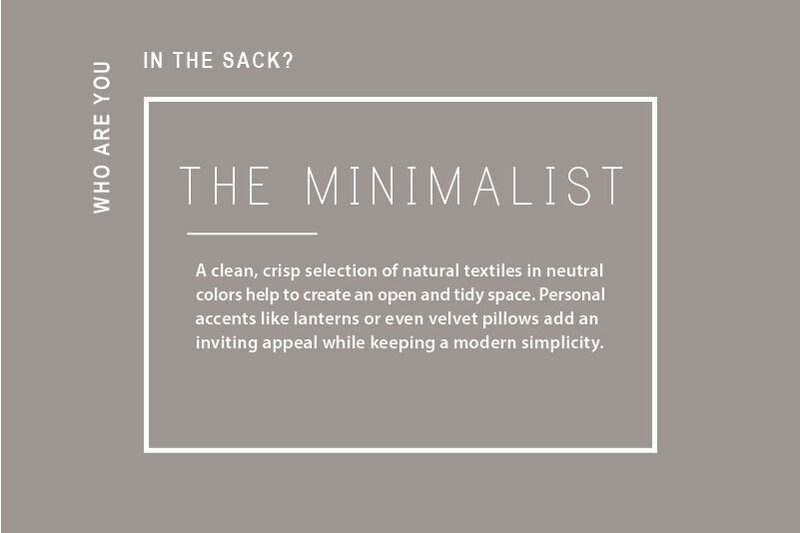 Who are you in the Sack- the Minimalist? The lines between contemporary design and minimalism are becoming more and more blurred with each passing day. So if you're craving peace and quiet in the bedroom- clean, simple bedding will support the mission for more R&R. And MATTEO knows just how to do that- featuring effortless bedding we feel guarantees some seriously sweet dreams. Minimalist bedroom design isn’t something that happens over night. By its very nature minimalism requires a high degree of organization and lack of clutter. The Sanders Bed Panel is a clean way to keep the under bed space under wraps with a more simplistic option than a bed skirt. Bonus, this 3-piece set starts above the top mattress to keep a uniform sleek look. Continuing with the Sanders collection, which is an environmentally friendly heavy linen washed to soft perfection, pick and choose your shams, duvet or sheets in an array of earthy colors. The simple texture of linen adds a punch to an otherwise simple room. A clean, crisp selection of natural textiles in neutral colors creates an open and tidy space. Personal accents like photos in oversized frames add an inviting appeal while keeping a modern simplicity. The Vintage Linen collection by MATTEO has an extremely soft hand and finished 1/2" hem detail. Contrast stitching after dyeing with darker colors offers a softer, lighter take than the Sanders collection. For a soft and smooth bed, MATTEO's 600 thread count Sei collection can still achieve a lived in look by adding a thermal throw and makes for perfect year round bedding. All MATTEO bedding is made in Los Angeles- garment-dyed and pre-washed to heirloom softness, making the bedding feel as if you've been sleeping on it for ages. A minimalist look when choosing bedding is also complementary with neutral tones, allowing for a true sanctuary in the bedroom. But think beyond your standard shades of white and gray, and consider other neutrals, like a soft pink or taupe. And copper accents to boot! Who are you in the Sack - the Escapist? Do you like to live like you're on vacation- serene French countryside retreats, earthy mountain resorts or calm seaside living? You don't have to travel far to feel like you're on holiday. POM POM and AMITY HOME offer the right mix of natural elements and layers to achieve a high-end, tranquil feeling. Adding some print and texture creates a bohemian vibe, reminiscent of ethnic destinations that open the mind. POM POM'S embroidered Annable collection in flax brings on that mindset. Adding a paisley print in a soft pop of color and natural fiber accessories keeps the look streamlined but unique. Layers of lace and cotton complimented by antiqued brass or bronze lend a French provincial look to any room. AMITY's Bianca collection's ruffles and linen add to this rural version of Parisian style. Vintage-inspired in all the right ways, POM POM's dreamy, soft cotton crochet forms a subtle zigzag pattern descending to sophisticated stringy ends- reminiscent of a romantic countryside getaway. Quilted details keep things charming and comfortable. Both POM POM and AMITY HOME are available special order through Gardenology. Who are you in the Sack - the Romantic? Do you tend to go for long flowy bedskirts, silk gauze layers, and lace or ruffled details? If you prefer an ethereal, feminine look in your bedroom, then you would love the soft luminous hues of BELLA NOTTE! The collection inspires with breathable linen, soft organic cotton, plush velvet and sumptuous satin combined with exquisite craftsmanship to create duvets, pillows, blankets and more. Starting with the base, BELLA NOTTE's Madera just so happens to be our bestselling sheet. 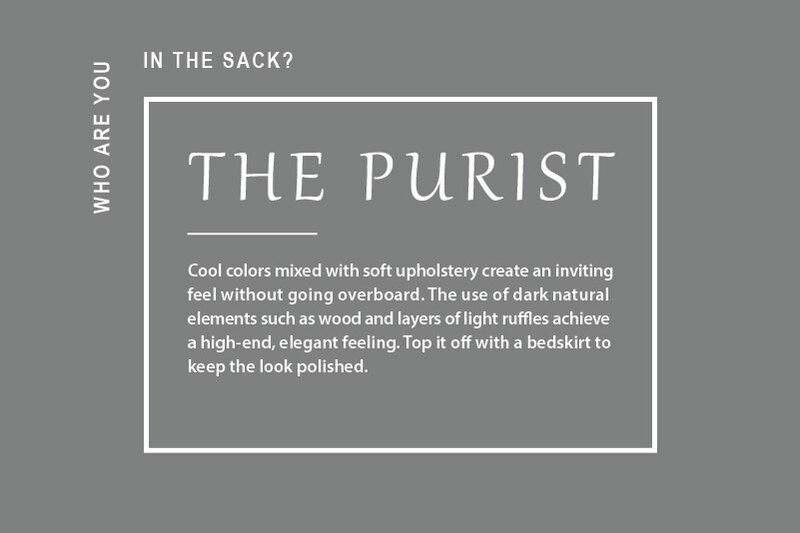 Smooth to the touch with a subtle luster, it's designed for ultimate comfort (100% Tencel) and easy care. Tencel wicks moisture away and warms to the touch, one reason why it's also used in ski clothing. 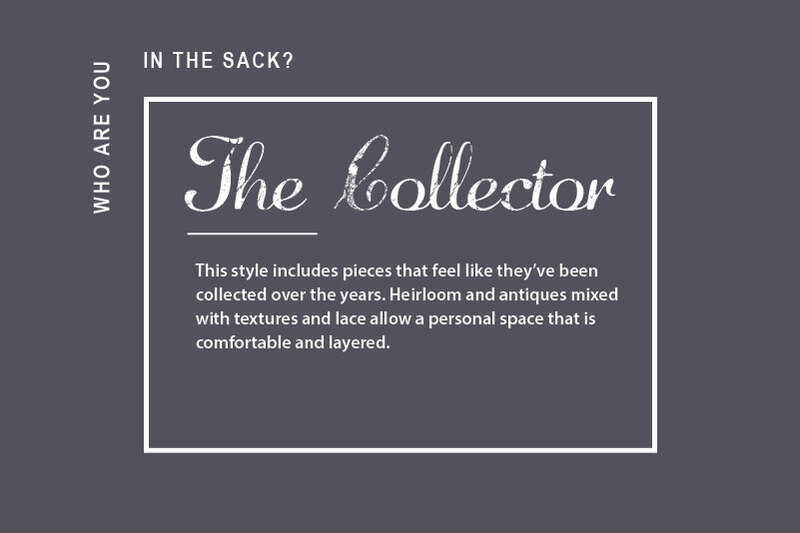 Add a Victorian element by adding heirloom and antique pieces to give a collected look. Bring balance with earthy colors and floral textures. New for 2016, BELLA NOTTE's new shades of cloud and fog not only echo the blue-grey mood of San Francisco, where the label is based, but beautifully round out a soothing bedroom palette. BELLA NOTTE uses a garment-dyed process where the complete garment is dyed rather than full yards of fabric, making it ever so slightly unique and couture in nature and adding to the soft, lived-in quality of the brand. Different hues from textures add depth and differentiation. Even a monotone look is special as shown here with the tonal floral pattern on the Lillian and Marguerite accent pillows. Bring themes of love, amore and romance to your bedroom boudoir sanctuary with luscious colors and printed silks. A whimsical watercolor print floats dreamily atop Silk Charmeuse in the Ophelia collection. Add charm with layers of tailored pleating and romantic embellishments - the Chloe collection's Trecento ruching lends vintage glamour to Cotton Velvet with warm tones of powder and heirloom rose. And for the single ladies or those with husbands that are willing to sleep in a feminine, delicate bed-- we suggest the Pennelope and Olivia collections with lace, 2-tone patterning and heirloom design. All BELLA NOTTE collections can be special ordered through Gardenology. We're getting ready to welcome Hilde to both of our stores this week, where she will be talking a little more about her inspiration and aesthetic, the linens she chooses and the production process, as well as showing us how to make up a cozy bed and giving suggestions for your own home. But first, we wanted to learn a little more about the brand and her every day life, read on! GARDENOLOGY: What would you say is the inspiration behind your designs? HILDE: My inspiration comes from growing up in Belgium and having linen as an essential in my everyday life. After moving to California and developing an appreciation for a relaxed lifestyle and coastal look, I was able to create Pom Pom which has both a casual and elegant style. I don’t have a specific design process but it usually starts from gathering collections of images that inspire me. It could be an abstract image of colors, the lace on a dress or a building architecture; just a variety and mix of things that I not only encounter from my travels around the world and experiencing different cultures or lifestyles, but also from my daily life. Story board Inspired by the beautiful colors you find at the beach, new textures recently introduced in the line such as cotton sateen, waffle textured linen and hand crochets. GARDENOLOGY: What is your studio/office space like? HILDE: I work and design in the open space of our ever changing showroom. This space allows me to play around with our samples, put them on the bed, and change things around. It is a place that encourages creativity and ideas. It’s really fun! GARDENOLOGY: Was working together as a family something you expected would happen? Where do each of your roles and daily tasks differ? HILDE: I am very fortunate to have both my sons work for Pom Pom at Home. I never expected this, but it has been such a blessing to be surrounded by my family. They are all tough critics but we all want the best for this company! My husband Reza and I are the creative force and do most of the traveling. Sam is VP of sales and Michael is our business development manager. GARDENOLOGY: What do you do to relax? HILDE: Since we are always busy in the city, I often try to escape for a weekend to Malibu beach or the Arrowhead Mountains. When staying home, we enjoy sharing a meal with good friends in our garden. GARDENOLOGY: What is the best piece of advice you have ever received? HILDE: My father always told me, “Never do anything I wouldn’t do.” I’ve lived by this quote my entire life. I was fortunate enough to have extremely hard working and loving parents. My mother is my biggest inspiration because of her positive outlook on life. All I wish to be is the same example for my sons. Boutique hotels are one of the first places we look to for bedroom inspiration- packed with decorating details to refresh any room. With luxurious linens and a whole host of conveniences, it’s no wonder we sleep so well when on vacay. Check out some of our favorite hotel style bedrooms, and take away some tricks of the trade for your own sophisticated boudoir. Our first stop on the map is the Seixo Hotel, in Lisbon. Just a short walk from the Praia da Mexilhoeira beach, this eco-friendly hotel with cement floors and pebble walls uses geothermal energy and solar power. Our first choice? The Land Room. Talk about magical. The ethereal, fairy-like feel of this room gives us a fluttering heart, or is that the heart mobile hanging above the bed? With driftwood accents from the nearby beaches and a textured bed in shades of oatmeal, this charming abode screams cozy. If you'd like to stick with nature, but add a little sophistication with a masculine feel, get inspired by the Tree Rooms. A tree-like canopy frame sits on top of a polished cement pedestal, creating a modern organic feel. And, well, you know how we feel about circular mirrors, so we had to stick in a photo of the earthy bathroom. The Catskills- the getaway hub for NY creatives who need a little nature in lieu of the concrete jungle. And Table on Ten, a refurbished 1860's house on Route 10, provides just that- with mismatched furniture and antiques creating a rustic, relaxed retreat. Owned by a carpenter and a chef, it's only natural that they would open a homey retreat that serves delicious meals. Enlisting the help of an Amsterdam based interior designer, the result is three primitive private bedrooms above the cafe. With handmade furnishings, simple organic bedding, beautiful natural light and a rustic copper bathtub- this room exudes the simplicity and charm of countryside living. Is your ideal morning routine waking up to picturesque white houses and sweeping views of the sea? Then the San Giorgio will do the trick, with its whitewashed buildings, poolside hammocks and striking rocky beach. Melding the carefree finesse of the '60s bohemian life with a down-to-earth “gypset” approach, how could you not feel relaxed? Natural wood furnishings and wicker accents combined with tiled floors, turkish towels and embroidered bedding bring life's simple pleasures together with a cultural aesthetic. Seaside living with an ethnic twist- but definitely replicable here in Southern California. A renewed collection of three exquisitely restored rental villas and a 12 room boutique hotel in what was once a cobbled medieval village. Homespun elegance at it's best in this ideal Tuscan romance. The bones of the room are classically Tuscan: stone walls, wood-beam ceilings and views from every window. But the highly styled and designed with gauzy drapes, recessed lighting, modern furnishings and natural light are all things that can be emulated in your own boudoir. Who are You in the Sack? Are you ready to make your dreams come true? Well there's no better place to start than the bedroom- the ultimate place where you can lay back and be you. While some may opt for a more simple approach, we at Gardenology can’t get enough of an abundance of super-soft blankets and pillows. If you’ve ever seen our store bed, than you know our motto is ‘bigger is better”. Switching up your sheets can be an easy (and affordable) way to make your whole room feel fresh – and let’s be honest, you deserve it! Take a look at 4 of our favorite bedroom styles below and decide what your personality says about your room style.